Pyramid Series Proximity® is recognized as an electronic-security benchmark for 125-kHz OEM proximity readers and credentials. 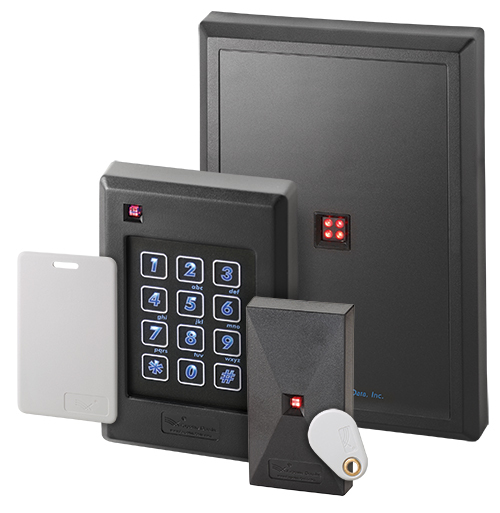 Based upon proven contactless digital radio frequency identification (RFID) technology, Pyramid products assure support with a wide range of standard electronic access control systems. Pyramid readers feature innovative, Farpointe-only features—such as MAXSecure™ and fleaPower™— that increase security and reduce energy consumption. Pyramid credentials, proximity cards and tags, are passive devices, eliminate maintenance by requiring no battery, and can be ordered to support several proximity reader technologies. fleaPower is Farpointe’s own eco-friendly “green technology” designed to help conserve the environment and reduce energy costs. The way we like to think about it is; would you leave a light bulb on overnight? Readers stay on 24 hours a day 7 days a week. This energy reduction will result in long term energy savings. Also, in emergency situations our fleaPower enabled readers can be powered much longer by back-up batteries. Farpointe’s Pro-X technology is the Pyramid Series Proximity® line’s standard hardware package designed to offer the industry’s leading read range. The Pro-X package guarantees consistent and exceptional read range even in the harshest of RF environments. Don’t fall short when it comes to read range! Read Range: Up to 5 inches (126 mm). MCR Proximity Readers - Support certain Indala ASP Advantage Series Proximity® formats and other protocols. EM Proximity Readers - Support certain EM proximity formats and other protocols.